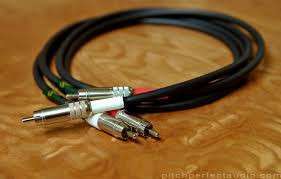 A23 speaker cable does not come from industrial drums. It is composed of 2 differently structured conductors of differing profiles which are manually twisted, coated in a green or gray jacket and then terminated with beryllium-copper banana plugs. These plugs are preferred, because of the minimum amount of material to filter the signal. The small diameter of these plugs do not allow solutions for bi-wiring, but it's possible to provide jumpers if desired. Since the speaker cable is manufactured manually, individually desired lengths are possible. 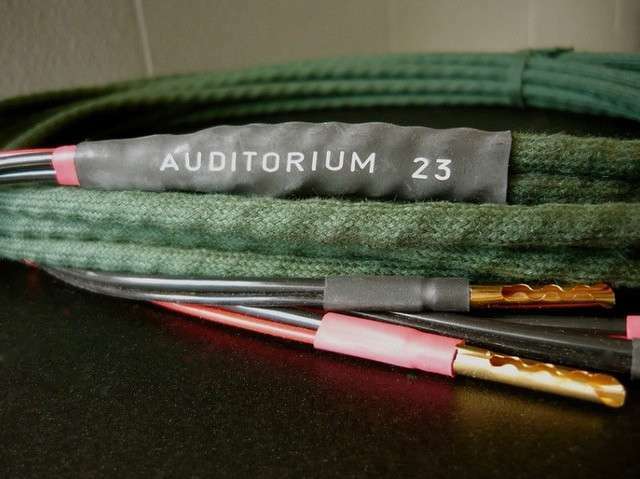 A23 speaker cable is manufactured unchanged since the early 1990s and still sounds as good as it did then! The Hommage line is joined by a new interconnect cable. This cable was developed as a partner to the speaker cables and is being manufactured exclusively for A23 to their specifications and hand terminated by them. It is available in individual lengths beginning at minimum lengths of 50 cm. The A23 interconnect cable has a parallel symmetrical composition with one side shielded. It is terminated with SWC-plugs, which are thoughtfully revised to follow the historical ideas of the manufacturer. Alternatively, it is available with 5-pin connectors for use as phono-cable. In May 2010 A23 Interconnect Cable received the Image Hifi Award 2010 by the German audio magazine Image Hifi Some comments: From Portugal: I already received the interconnect cables from you. I already heard them about 2 hours ... Congratulations! Very good sound! My 300 B amp is sounding much better with your cables, better timbre, more emotion, better dynamics... From Spain: Well, the product for my system is really good, just music, natural and very, very musical. Actually I don't think about highs extensions, mids and bass, the interconnects simply dissapear. Your products are magic! From France: I have just tried your new interconnect cable that Alain lent me for the week end and it is fantastic!! It sounds ...well like ... NO CABLE!! Transparency, emotion, details, rythm, tempo, image, it has everything, I could not stop listening and rediscovering record after record. Good job, BRAVO.